There’s a good chance you or someone you know has tried essential oils for stress. Essential oils have long been used as a form of aromatherapy for stress relief, and to aid a variety of conditions. The oils are extracts of plants traditionally used to heal, and when diffused into the atmosphere and inhaled, they can offer therapeutic effects. For example, they can calm the nerves, provide energy, induce relaxation, provide stress relief, or offer several other functions that are helpful in virtually any situation. The limbic system is responsible for emotional responses and is directly connected to organs that are triggered during an emotional response. Heart rate, blood pressure, breathing, memory, stress levels, and hormone balance are all directly tied to your limbic system, which helps explain how scents can trigger or suppress certain feelings or emotions. What are the best essential oils for stress relief? Several studies suggest that aromatherapy with essential oils can reduce stress and anxiety, and improve sleep. In this section, we will detail nine specific essential oils for stress relief. Among the best essential oils for stress reduction is lavender essential oil. This is because lavender (Lavandula angustifolia) oil has a calming effect on both the body and mind, and can therefore reduce anxiety, depression, and stress. Lavender oil can also improve sleep quality and relieve mild insomnia. A study published in the Journal of Alternative and Complementary Medicine in 2016 found that those who had inhaled lavender prior to being stressed performed better on cognitive tests than those inhaling a placebo aroma. Another study published in the International Journal of Nursing Practice in 2013 found that aromatherapy with a three percent lavender oil spray was effective in lowering work-related stress for three to four days. Moreover, a 2012 study published in the Journal of the Medical Association of Thailand found that lavender oil calmed the nervous system by lowering heart rate, blood pressure, and skin temperature while also changing the brain waves to a more relaxed state. Studies using functional magnetic resonance imaging (fMRI) and electroencephalography (EEG) show significant changes during lavender oil use that are consistent with relaxation effects. Bergamot (Citrus bergamia) is a hybrid fruit with the characteristics of a lemon, lime, and bitter orange. Bergamot essential oil has a calming effect often used to treat depression, anxiety, insomnia, and stress, and it can also induce relaxation and reduce agitation, blood pressure, and heart rate. A study published in the journal Phytotherapy Research in 2017 found that inhaling bergamot essential oil for 15 minutes had improved positive feelings in participants at a mental health treatment center. Another study published in the journal Complementary Medicine Research in 2015 suggests that bergamot essential oil may improve negative emotions and reduce levels of a stress hormone called cortisol. Recent research has also found that bergamot can change brain waves on an EEG. Bergamot has been proven to lower corticosterone response to stress in rat studies. Lemongrass (Cymbopogon citratus) essential oil is another one of the better essential oils for stress relief, relieving anxiety, insomnia, and irritability and promoting relaxation. The hypnotic and sedative properties of lemongrass essential oil may also improve the quality and duration of sleep. A study published in the Journal of Alternative and Complementary Medicine in 2015 found that those exposed to lemongrass essential oil had an immediate reduction in tension and anxiety. The participants had recovered significantly better from an anxiety-induced situation compared to those who inhaled a placebo oil or control aroma with tea tree oil. Neroli essential oil is one of the oils sourced from the flowers of the bitter orange tree (Citrus aurantium). Bitter orange oil and petitgrain essential oil are also sourced from the bitter orange tree. Neroli essential oil can be used to promote calmness, relieve anxiety and excessive worrying, reduce stress, and lower blood pressure. A study published in the journal Evidence-Based Complementary and Alternative Medicine in 2012 found that inhaling an essential oil that included neroli oil had significantly reduced systolic and diastolic blood pressure when compared to a control and placebo in 83 pre-hypertensive and hypertensive participants. The neroli essential oil also significantly reduced the concentration of salivary cortisol—a stress hormone. Another one of the better essential oils for stress relief is lemon (Citrus limon) essential oil. Lemon essential oil is rich in linalool, which is a compound also found in oranges, lavender, and basil. As a result, lemon essential oil is thought to ease depression, relieve stress, promote sleep and relaxation, and improve overall mood. Preliminary animal studies have found that lemon essential oil has sedative and anti-anxiety properties. Japanese yuzu (Citrus junos) is another citrus fruit that belongs to the Rutaceae family. It is Japanese custom to take “yuzu baths” where whole yuzu fruits are placed in a hot bath for stress relief, and this practice dates back to the 18th century. Yuzu essential oil is able to enhance mood, reduce levels of anxiety and anger, and decrease emotional stress. It can also suppress the sympathetic nervous system, and this helps promote relaxation. In a study published in the journal BioPsychoSocial Medicine in 2016, Japanese researchers found that the scent of yuzu could soothe stress and anxiety, and reduce the heart rate in just 10 minutes. Inhalation of yuzu may also alleviate emotional stress and reduce salivary chromogranin A—an indication of stress and sympathetic nervous system activity. Other research shows that inhalation of yuzu essential oil reduced anxiety levels in mothers caring for their sick child at a pediatric clinic. Another essential oil for stress is orange oil, which comes from the outer peel of the fruit of the Citrus sinensis orange plant. It is also sometimes called sweet orange oil. Orange essential oil has a direct effect on the olfactory system of the brain, which is responsible for emotional response. Inhaling orange oil can boost your mood and promote relaxation. It can also help balance stress hormones like cortisol. A study published in the Journal of Alternative and Complementary Medicine in 2012 found that those inhaling sweet orange essential oil did not experience increased anxiety or tension during an anxiety-inducing situation, whereas those who inhaled a placebo or tea tree oil had experienced an increase in anxiety or tension. Bitter orange is another type of orange essential oil that has been found to decrease anxiety, specifically during a simulated public speaking event, according to a 2017 study published in the Evidence-Based Complementary and Alternative Medicine. Another good essential oil for stress is ylang ylang (Cananga odorata) essential oil, which comes from the flower petals of the large, tropical ylang ylang tree. Inhaling ylang ylang oil has a direct effect on the olfactory system of your brain, and this can help improve your mood, release negative emotions, and lower stress responses like high blood pressure and a fast heartbeat. A study published in the journal Evidence-Based Complementary and Alternative Medicine in 2012 found that inhaling an aromatherapy blend with ylang ylang essential oil could reduce cortisol and blood pressure levels. Other research shows that ylang ylang oil can help calm the nervous system, which also lowered blood pressure and the heart rate. Frankincense essential oil is sourced from the resin of the Boswellia serrate, Boswellia ferreana, and Boswellia carterii trees. Although many associate frankincense with the biblical gifts given to Jesus by the wise men, this essential oil is especially good for relieving stress, anxiety, and depression and reducing high blood pressure and a high heart rate. Although research showing that frankincense oil can reduce stress is lacking, the best existing evidence seems to be clinical and first-hand evidence. Try frankincense oil and combine it with other relaxing oils like orange, lavender, or lemon essential oil. Inhalation: You can diffuse essential oils at home using a diffuser, or inhale them directly from the bottle. Also keep a couple bottles of essential oils on hand, and inhale whenever stressed. Topically: You can also reduce stress by applying a combination of essential oils to your skin. However, before you apply any essential oil to your skin, you should dilute it with a carrier oil like jojoba oil or coconut oil, in a 1:1 ratio. You should also do a patch test on a small area of your skin before applying essential oils all over your skin. Once you react well to essential oils on your skin, you can also add a few drops of essential oils to your shower, a warm bath, body wash, or lotion. When adding essential oils to your shower, cover the drain with a cloth and breathe in to immerse yourself in an essential oil steam. Internally: You can also ingest essential oils when using a very high-quality, unadulterated, organic, reputable, and therapeutic-grade brand. You can add a drop of essential oil to water or tea to help relieve stress. There are many effective essential oils for stress relief. When you inhale essential oils, this has an impact on your limbic system, which is responsible for emotional responses. As a result, essential oils can help reduce heart rate, blood pressure, depression, anxiety, and stress levels. 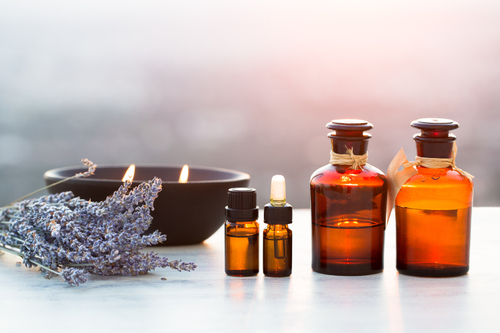 In this article, we detailed some of the best essential oils for stress relief, including lavender oil, bergamot oil, lemongrass oil, neroli oil, lemon oil, yuzu oil, orange oil, ylang ylang oil, and frankincense oil. Other essential oils for stress relief include rose oil, marjoram oil, vetiver oil, chamomile oil, geranium oil, cinnamon oil, fennel oil, clary sage oil, jasmine oil, and rosewood oil. University of Minnesota Center for Spirituality and Healing, “How do Essential Oils Work?” takingcharge.csh.umn.edu, July 16. 2013; http://www.takingcharge.csh.umn.edu/explore-healing-practices/aromatherapy/how-do-essential-oils-work, last accessed March 4, 2016. Wei, M., “6 Aromatherapy Essential Oils for Stress Relief and Sleep,” Huffington Post, April 29, 2016; https://www.huffingtonpost.com/marlynn-wei-md-jd/6-aromatherapy-essential-_b_9805630.html, last updated April 30, 2017. Chamine, I., et al., “Aroma Effects on Physiologic and Cognitive Function Following Acute Stress: A Mechanism Investigation,” The Journal of Alternative and Complementary Medicine, Sept. 2016; 22(9), doi: 10.1089/acm.2015.0349. Chen, M., et al., “The effects of aromatherapy in relieving symptoms related to job stress among nurses,” International Journal of Nursing Practice, Nov. 2013, doi: 10.1111/ijn.12229. Satorwan, W., et al., “The effects of lavender oil inhalation on emotional states, autonomic nervous system, and brain electrical activity,” Journal of the Medical Association of Thailand, April 2012; 95(4): 598-606, PMID: 22612017. Han, X., et al., “Bergamot (Citrus bergamia) Essential Oil Inhalation Improves Positive Feelings in the Waiting Room of a Mental Health Treatment Center: A Pilot Study,” Phytotherapy Research, March 2017; 31(5), doi: 10.1002/ptr.5806. Watanabe, E., et al., “Effects of Bergamot (Citrus bergamia (Risso) Wright & Arn.) Essential Oil Aromatherapy on Mood States, Parasympathetic Nervous System Activity, and Salivary Cortisol Levels in 41 Healthy Females,” Complementary Medicine Research, 2015; 22: 43-49, doi: 10.1159/000380989. Costa Goes, T., et al., “Effect of Lemongrass Aroma on Experimental Anxiety in Humans,” The Journal of Alternative and Complementary Medicine, Dec. 2015; 21(12), doi: 10.1089/acm.2015.0099. Kim, I., et al., “Essential oil inhalation on blood pressure and salivary cortisol levels in prehypertensive and hypertensive subjects,” Evidence-Based Complementary and Alternative Medicine, 2012; 2012: 984203, doi: 10.1155/2012/984203. Matsumoto, T., et al., “Aromatic effects of a Japanese citrus fruit-yuzu (Citrus junos Sieb. Ex Tanaka)-on psychoemotional states and autonomic nervous system activity during the menstrual cycle: a single-blind randomized controlled crossover study,” BioPsychoSocial Medicine, April 2016; 10: 11, doi: 10.1186/s13030-016-0063-7. Matsumoto, T., et al., “Effects of Olfactory Stimulation from the Fragrance of the Japanese Citrus Fruit Yuzu (Citrus junos Sieb. Ex Tanaka) on Mood States and Salivary Chromogranin A as an Endocrinologic Stress Marker,” The Journal of Alternative and Complementary Medicine, June 2015; 20(6), doi: 10.1089/acm.2013.0425. Ueki, S., “Effectiveness of aromatherapy in decreasing maternal anxiety for a sick child undergoing infusion in a paediatric clinic,” Complementary Therapies in Medicine, Dec. 2014; 22(6), 1019-1026, doi: 10.1016/j.ctim.2014.09.004. Costa Goes, T., et al., “Effect of Sweet Orange Aroma on Experimental Anxiety in Humans,” The Journal of Alternative and Complementary Medicine, Aug. 2012; 18(8), doi: 10.1089/acm.2011.0551. Chaves Neto, G., et al., “Anxiolytic Effect of Citrus aurantium L. in Crack Users,” Evidence-Based Complementary and Alternative Medicine, 2017, doi: 10.1155/2017/7217619. Hongratanaworakit, T., et al., “Relaxing effect of ylang ylang oil on humans after transdermal absorption,” Phytotherapy Research, Sept. 2006; 20(9): 758-763, doi: 10.1002/ptr.1950.